Ceiba 3: 106. 1952. TYPE: Panama. Darien: rain forest, E slope, Cana-Cuasi Trail, Chepe-ganaDist.,ProvinciaReal, 1,650m, 16Mar. 1940, Terry & Terry 1595 (F). Epiphyte; stems 4-10 cm long, 5-10 mm diam. ; roots thin, green, descending; cataphylls thin, 2-2.5 cm long, rounded at apex, drying brown, weathering into fine, persistent fibers. 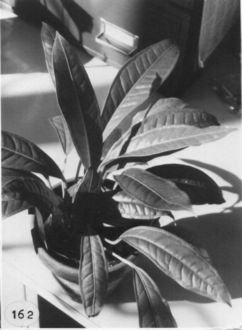 LEAVES erect-spreading; petioles 4-14 cm long, 2-4 mm diam., subterete, sharply sulcate adaxially, conspicuously reddish brown glandular-punctate; geniculum 1-1.5 cm long, scarcely thicker or paler than petiole; blades elliptic to oblanceolate, chartaceous, acuminate at apex, acute to obtuse at base, 8.5-28 cm long, 2.4-6 cm wide, broadest at middle or just below; both surfaces semiglossy, the upper surface obscurely glandular-punctate, the lower surface much paler and conspicuously black glandular-punctate; midrib convexly raised above, more acute near apex, abruptly sunken at apex, acutely to obtusely raised below; primary lateral veins 10-13 per side, departing midrib at 50-60° angle, sunken in valleys above, raised below, straight or weakly curved to collective vein; interprimary veins scarcely visible; collective vein arising from the base, 2-4 mm from the margin, sunken above, raised below. INFLORESCENCE erect-spreading or pendent; peduncle 13-33 cm long, 2-3 mm diam., terete; to 6 times as long as petioles; spathe chartaceous, pale green, lanceolate, 2-3.5 cm long, 6-7 mm wide, broadest near base, gradually acuminate at apex, rounded at base, inserted at 90° angle on peduncle; spadix yellow-green, 2.1-6.5 cm long, 4÷5 mm diam. midway; flowers square, 3.2-3.8 mm in both directions, the sides straight to weakly sigmoid, 3-4 flowers visible in the principal spiral, 8-9 visible in the alternate spiral; tepals glossy, sparsely punctate, densely and minutely papillate with minute droplets; lateral tepals 1-1.2 mm wide, the inner margin concave to straight; pistils emergent, green, glossy; stigmas elliptic; stamens emerging in a slow, regular sequence from the base, laterals preceding alternates by 2-3 spirals; exserted on translucent filaments ca. 0.5 mm long, retracting to hold anthers at edge of tepals; anthers white, persisting, 0.8 mm in both directions; thecae oblong; pollen white. INFRUCTESCENCE with berries white turning purplish, depressed-globose, ca. 6 mm diam. ; mesocarp with numerous, short raphide cells; seeds (1-)2-4, ovoid-ellipsoid, greenish white, 2-2.3 mm long, 1.5-1.8 mm wide, ca. 1 mm thick, enveloped by a sticky, transparent, gelatinous envelope, thicker to one side and extending beyond one end. Figs. 162 and 163. Anthurium terryae is endemic to Panama in Serrania de Pirre in Daricn Province from 700 to 1,400 m in premontane rain forest. The species is in section Porphyrochitonium and is distinguished by its narrowly oblanceo-late-elliptic, short petiolate blades that dry gray-green to blackened, its subtercte, flat-sulcate, margined petioles that are usually one-fifth to one-half as long as the blades (rarely almost as long), its green, reflexed to spreading, lanceolate spathe, its green, relatively short spadix, and by its white to purplish berries. The inflorescence is variable. Live plants of Croat 37829 have inflorescences that consistently turn downward on a curved peduncle and are often turned in among the petioles and difficult to see (presumably they are held below the roots in nature). In addition, the spadix is markedly curved. An unnumbered Dillon collection has inflorescences erect with moderately straight spadices. Anthurium terryae is similar to A. Pirrense with which it occurs on Cerro Pirre (see that species for differences) and also to A. lactifructum from the Serrania de Canasas. The latter differs in having coriaceous, usually more or less elliptic blades with the primary lateral veins not sunken on the upper surface but merely weakly etched. The blades of A. terryae are much thinner with the primary lateral veins and the collective veins markedly sunken. 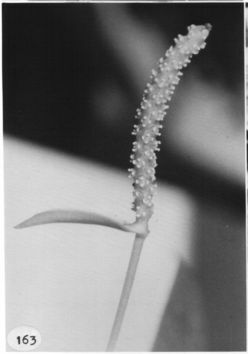 Anthurium pirrense also differs in having stamens that are not exserted above the tepals and are eventually retracted, whereas those of A. terryae are at least initially exserted well above the tepals and persist at the level of the tepals. Anthurium terryae and A. crassitepalum occur in the same region, are of similar size, and have white fruits. The former is distinguished by having leaf blades usually oblanceolate and spadices that frequently dry with the stamens exserted and the tepals not swollen toward their outer margins. Panama Darien: 1300 - 1520 m,, 19 Apr. 1980, Al Gentry 28721 (COL, MO). Panama Darien: 700-1000 m, 08.00N 77.45W, 7 Febrero 1991, H. Herrera, L. Rojas y N. Brist‡n Jr. 875 (MO). Panama Darien: 700-1000 m, 08.00N 77.45W, 7 Febrero 1991, H. Herrera, L. Rojas y N. Brist‡n Jr. 855 (MO). Panama Darien: 800-1050 m, 7.56N 77.45W, 29 June 1988, Thomas B. Croat 68946 (AAU,CAS,CM,MO,PMA,US). Panama Darien: 1200-1600 m, 7.42N 77.42W, 19 Apr. 1992, Foster 14158 (MO, PMA). Panama Darien: 1250-1500 m, 7.45N 77.40W, 3 March 1988, Gordon McPherson 12203 (MO). Panama Darien: Cerro Pirre, 1000-1080 m, 8.00N 77.45W, 14 September 1989, G. McPherson 14081 (MO). Panama Darien: Cerro Pirre Region, 1310-1430 m,, 27 July 1976, Thomas B. Croat 37829 (MO). Panama Darien: 2500 - 4500 f,, 9 Aug. 1967, Duke & Elias 13732 (COL). Colombia Antioquia: Las Orquideas, 1150-1300 m, 6.34N 76.19W, 26 July 1988, A. Cogollo et al. 3507 (JAUM, MO). Colombia Antioquia: 1680 m, 06.40N 76.30W, 2 March 1992, Al Gentry, C. Barbosa & D. Cardenas 76051 (MO).